3 Monkeys is always striving to bring the arcade experience to our customers in entirely new ways. With Xtreme Racing 2.0, we've done just that! Up to 8 players can race at a time in this sit down racing simulator featuring the latest technology to make every second as realistic as possible. Our goal is to provide the most realistic racing experience possible in a small form factor. We've taken high end force-feedback racing wheels, married them to 32" HD monitors, top of the line video game systems and our custom racing cockpits. Add it all together and drivers feel like they are at the track racing at 200mph! Xtreme Racing is a great way to bring out the competitive juices. Whether a crowd of 1000, a group of 10 or anywhere in between, we'll organize everything and crown the winner of every race! 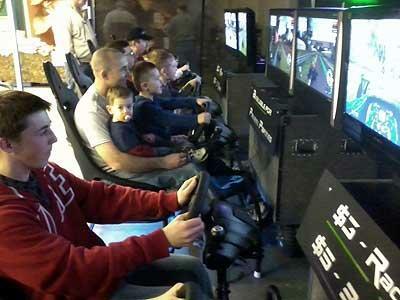 Xtreme Racing can be set up as a 4-seat attraction or an 8-seat attraction. The 4-seat setup requires 10' x 20' of space. The 4-racer setup can accommodate up to 50 racers an hour. The 8-seat version requires 10' x 40' of space and can accommodate up to 100 racers an hour. Xtreme Racing is for racers ages 10 and up and requires one 20-amp circuit per two seats to operate. Call us at (717) 650-7657 for pricing and more information.